April is national poetry month, but you do not have to wait until those rainy days next spring to do fun poetry activities with your students. Try one or all of the following activities with your ESL students to help them appreciate the finer language of verse. Make a poetry connection a cultural connection for your Japanese students by writing haiku as a class. While you are in the competitive mood, why not host your own poetry slam. In a typical poetry slam, participants recite a poem for the audience who judges the performance based on the poem itself and the performance. You can find details on hosting a poetry slam at poetryslam.com and get a feel for what a poetry slam is like. Feel free to allow your students to perform either their own poems or those of favorite poets, and have the class vote for a winner by applause. Your students will benefit from memorizing poetry and have fun with the performance aspect of their reading, just make sure you provide adequate time in class or at home for your students to memorize their poems. You can make poetry personal for your students by introducing them to the popular piece Keep a Poem in Your Pocket by Beatrice Schenk de Regniers. After reading this poem with your class, use envelopes to make and decorate pockets that your students can attach to their desks. Each day of your poetry unit, have your students copy a favorite poem on to an index card and put it in their pocket. At the end of your unit, have your students make a cover and bind the index cards into a book. You can also challenge your students to memorize one of the poems they copied. You can ask them to perform the poem in front of the class or simply share with a friend or family member and relay the details of the experience. Are you looking for an easy poetry activity for an independent learning center? Why not give your students access to a set of Magnetic Poetry? This simple collection of magnets sports one word on each piece of magnet. If you give students a magnetic white board or other magnetic surface, they can compose their own free verse poems with the available words. Your students will have fun exercising their creativity through play. Even if they only use the words to create long sentences, they will be practicing their grammar skills and word order rules through an activity that feels more like a game than language studies. Once your students are in the poetry mood, you can have them write their own simple poems based on “Beans, Beans, Beans” by Lucia and James Hymes in Hooray for Chocolate. Read the poem to your class and then write it on the board. Go through the poem and label each “beans” as a noun and each of the words that describe the beans as adjectives. Then write a class poem modeled after “Beans, Beans, Beans” using the noun pie, for example. Brainstorm a list of different pies and then arrange them to fit into the poem in place of the different types of beans. Your students will find this poetry puzzle enjoyable, and then challenge them to write their own poems in the same style. They can use the noun bugs or pickles or books…any noun will do as long as they can think of descriptive words for it. You can have your students illustrate their poems and then display them on a bulletin board for the class to read (and giggle at) during their free time. A lesson on poetry is also a good time to review the phonics of vowels with your students. Though many words with the same final spellings rhyme, that is not always the case. Review with your students the different sounds that vowels and vowel combinations make. Point out to your students that although word pairs like “look” and “spook” are spelled the same (after the initial consonant sound) the words do not rhyme. If you can, let your students look though a rhyming dictionary to find other pairs of words which do rhyme but are not spelled the same. Once your students have become familiar with some poems, you can give them an independent assignment using the computer lab. Have each student or pair of students choose a favorite poem of at least five lines. Then have him create a power point presentation to illustrate the poem. He should write out one line per slide and find a picture that goes well with the line. Once all the presentations are complete, have a poetry “reading” in which you play the presentations for your class. You may want to lead a short discussion following the “reading” asking your students how the slide shows helped them understand the poems. A study of poetry is also a good time to review stress in pronunciation. Many poems follow a pattern not only for syllables but also for stress. The most well known stress pattern in poetry is probably the iambs which traditionally make up a sonnet. An iamb is a two-syllable word or pair of words which follows the pattern of unstressed/stressed. Iambic pentameter, five sets of iambs, is the structure of one line of a traditional sonnet. If you like and your students’ have the language ability to do so, look at one of Shakespeare’s sonnets and have your students identify the stressed words throughout. Then have your students try their hands at writing their own sonnets. They do not have to be love poems; you can write a sonnet about anything. If you happen to be nearing Feb. 14th, though, you may want to encourage a romantic feel in your students’ work. Limericks are another fun poetry pattern that your students may enjoy composing. You can find a more detailed explanation and example at Wikipedia.com, but the basic pattern of a limerick is five lines following the rhyme pattern AABBA. The A lines should have three sets of three syllables each, and the B lines should have two sets of three syllables each. Limericks are often humorous and lighthearted, sometimes making a joke. You can encourage your students to be funny if they can when writing limericks, and be sure to share some examples with them, but keep them clean. Shel Silverstein is one of today’s most enjoyable children’s poets. If possible, keep a collection of his books in your classroom for your students to read during their free reading periods. For national poetry month 2003, he made available on his web site several activities with poetry and rhyming. You can use these activities with your class for homework, class work or time fillers during your poetry unit. Poetry does not have to be an intimidating subject for the ESL teacher. 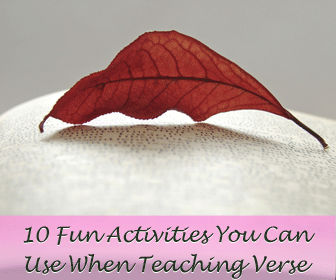 There are several creative and enjoyable activities you can do with your class when studying verse. Hopefully, this top ten will whet your appetite for the delicate language of poetry and set you and your students toward a lifelong love of poetry.